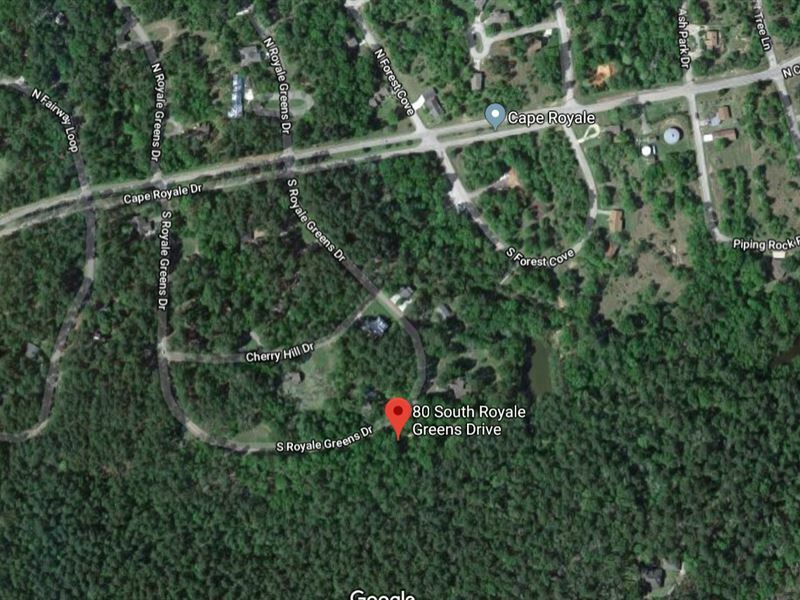 We are pleased to offer for sale this very desirable single family detached building lot located in the exclusive Cape Royale King Ridge 1 section of Lake Livingston, located in San Jacinto County Texas. This infill lot, whose address is 80 S Royale Greens is part of the fabulous Cape Royale Gated Community. This lot has paved road frontage, city sewer and water, and underground utilities. The lot has easy access to Lake Livingston, and is close to the community marina and clubhouse. Gated community with round the clock security, all amenities for four seasons of active living. Cape Royale is a destination resort style community with private gated access, paved streets with all public utilities. Wooded lots, many with view of the lake, parks, golf courses and other public amenities which are owed by the community. Along with challenging golf courses and a beautiful clubhouse, there are pools, tennis boating including of course the Cape Royale Marina. Wonderful neighbors, low crime, low taxes and low maintenance fees. Just a fantastic place to live, raise a family, retire, use for a weekend retreat. Or invest in the lot for future resale. Meanwhile, make use of all the common amenities, as thee is no timeframe to build. You are welcome to use the facilities as a member in good standing. The wooded lot is surrounded by newer existing single family homes and other valuable vacant lots owned by our company. The lot is perfect for active year round use as well as the site for getaway family weekends or vacations. Ownership affords you membership in the entire Lake Livingston Community. It also affords you the private, exclusive membership within the gates of Cape Royale. You will not be disappointed with this purchase. This real estate should afford your family a lifetime of enjoyment. Should you be a real estate investor, buy now while the price is low and watch the values rise in the coming years. Real estate taxes are and are paid current. For 2016 the dues are now per year. Any outstanding POA Dues will be brought current to end of year 2016.